A gorget serves many functions and traditionally, does any of the three following things. It serves as decoration, it acts a harness to support additional pieces of armour, or it protects the neck. Our Solomon Leather Gorget can do all three of these. This leather gorget is skillfully hand-crafted from thick, top-quality 13/15 oz. leather that is both resilient and strong, making it ideally suited for use in leather armour. It features a simple rounded shape lined with metal rivets, which adds to the gorgets strength, as well as its overall appearance. The Solomon Leather Gorget also features ring harnesses over the shoulders, which allow it to support additional pieces of armour, primarily pauldrons and other styles of shoulder armour. It is also very easy to put on. It secures easily in place via a pair of buckles and straps that ensure it does not fall off the shoulders. The Solomon Leather Gorget pairs wonderfully with several of our other leather armour items, and it is very-nearly a must-have item if you are going to wear any of our leather pauldrons. 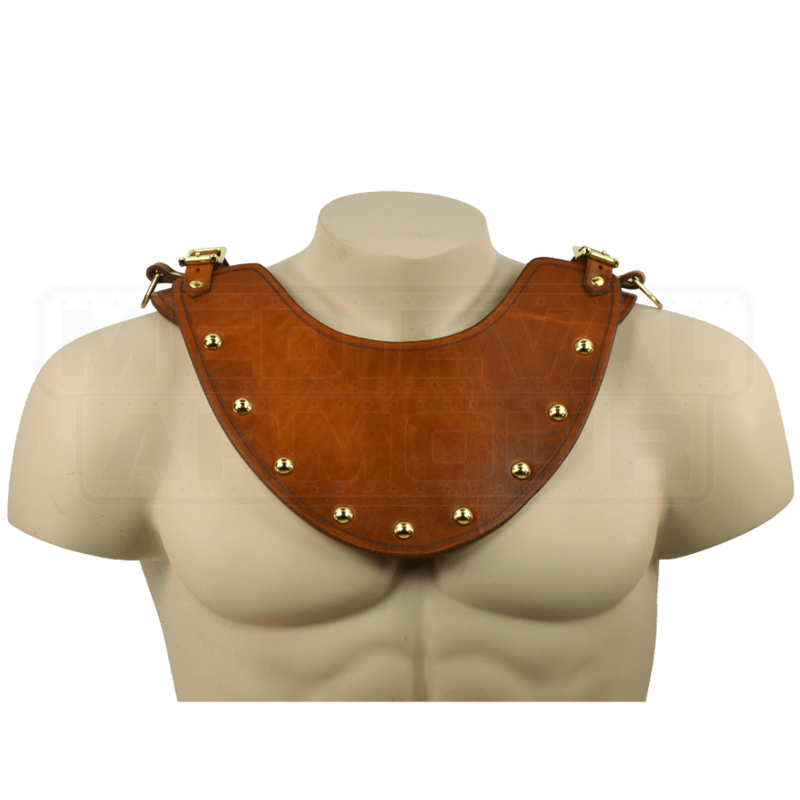 The Solomon Leather Gorget comes with a front and back neck plate that are molded to naturally and comfortably fit over the shoulders. There is a d-ring at each shoulder where you can buckle your pauldrons on if needed.